Shrimp (pictured), scallops, smoked black cod and Bacalao are among the rotating types of seafood featured in the Seafood Benedict at Roe Seafood in Long Beach, Calif.
Bluefish, shrimp and bottarga (salted and cured fish roe) aren’t the first ingredients most Americans associate with breakfast, but as more diners seek a wider variety of seafood on menus, more restaurants are offering breakfast dishes that feature premium fish and shellfish. According to Datassential’s 2017 MenuTrends Keynote Report, the morning meal is fertile ground for seafood, with both fish and shellfish having grown by at least 40 percent over the past decade on breakfast menus. Seafood varieties such as oysters, trout, mussels, clams and shrimp, as well as fish, have all grown on morning menus by double-digits in the last four years. 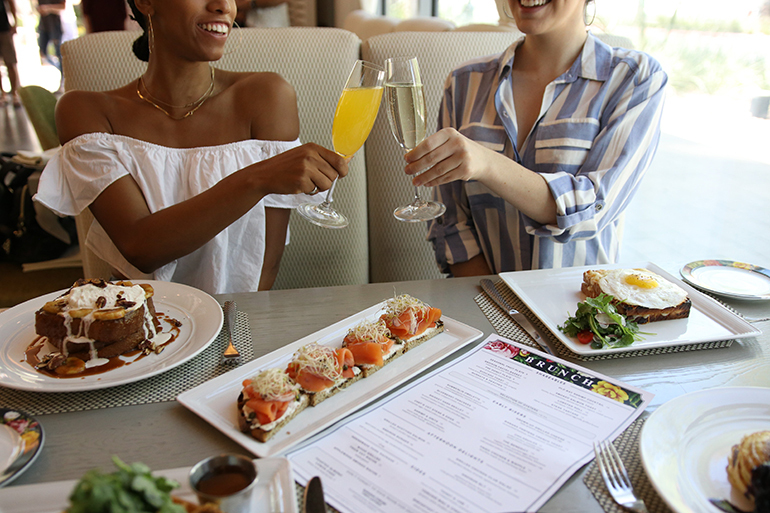 Chef Kim Canteenwalla of Andiron Steak & Sea in Las Vegas, offers smoked salmon toast, an avocado toast meets lox-and-bagels dish made with smoked salmon, housemade ricotta with lemon zest, local tomatoes, shaved red onion, capers and radish sprouts, priced at $17. Many chefs are incorporating fish and shellfish into their morning menus by using it, and other premium ingredients, to elevate familiar formats, especially eggs Benedict, grits, toast and bagels. At Roe Seafood, a restaurant and fresh-fish market in Long Beach, Calif., about 80 percent of chef and owner Arthur Gonzalez’s brunch menu is focused on seafood. Among the current offerings is seafood Benedict, made with jumbo shrimp, Swiss chard and charred onion sauce on a French muffin, priced at $16. Gonzalez specifically omits the type of seafood on the menu so he has the flexibility to change it depending on what is locally caught or in season. The Benedict was added to the menu when Roe first began serving brunch last March, and Gonzalez said it’s always a favorite. While crab cake Benedict can be found on many menus, at Tavern62 in New York City, chef David Burke offers a crunchy, salty spin with his pretzel-crusted crab cake Benedict with poached eggs, tomato, avocado and Old Bay hollandaise, priced at $23. Avocado toast gets a seafood spin at the newly opened Blue Hen, a classic fine-dining restaurant in the Adelphi Hotel in Saratoga Springs, N.Y. The hotel restaurant’s avocado toast is made with smoked and cured egg yolk, tuna bottarga, radish and cilantro, priced at $13. “Avocado toast being such a superstar, that is growing in terms of seafood mentions,” Rodriguez of Datassential said. Shrimp and grits with a poached egg, spice-rubbed shrimp, Parmesan grits and Pamplona chorizo butter at Restauration in Long Beach, Calif.
Also on the Blue Hen menu is a crab Benedict elevated by using King crab, a Gruyère popover, béarnaise and fire-roasted potatoes, priced at $24. Since launching the brunch menu in 2014 at Del Campo in Washington, D.C., chef Victor Albisu has been including premium seafood, such as lobster scrambled eggs, and garnishing many dishes with trout roe or salmon roe. The eggs and crab toast takes upscale seafood breakfast to oceanic proportions by including on the toast not only crab, but also smoked trout roe and smoked caviar. Canteenwalla also offers a version of shrimp and grits, elevating it by adding aged white Cheddar cheese, jalapeño crème fraîche and applewood bacon, priced at $18. 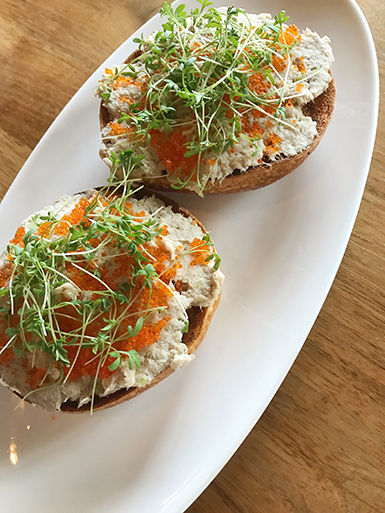 A house-made smokey bluefish spread on locally made bagel topped with fish roe at Split-Rail in Chicago. Both items were added to the menu this year and continue to gain popularity, Canteenwalla said. Meanwhile, Zoe Schor, executive chef and owner of Split Rail in Chicago, puts a creative spin on bagels with lox or whitefish by swapping salmon for her housemade smoky bluefish spread, which she schmears on a locally made bagel topped with a smattering of tobiko, or flying fish roe, and microgreens. Shrimp and grits, the popular Southern morning meal, gets a twist at Arroz in Washington, D.C., in a harissa shrimp and grits dish with coddled egg, charred peppers and six-month-aged Manchego cheese. 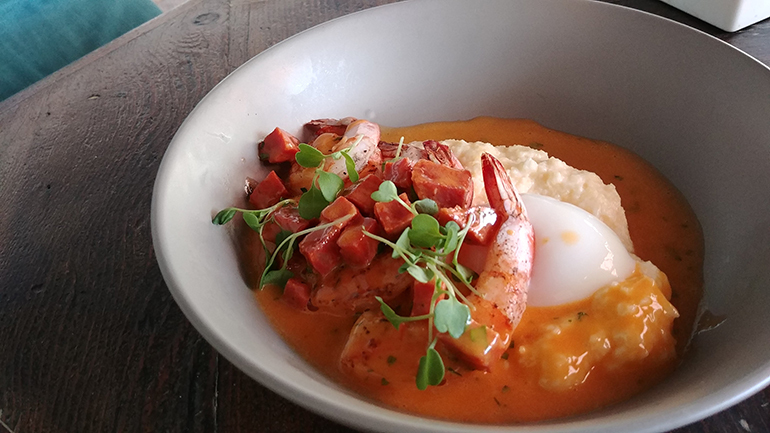 At Restauration in Long Beach, Calif., the shrimp and grits has poached egg, spice-rubbed shrimp, Parmesan grits and Pamplona chorizo butter. “It really reflects the culinary point of view we showcase at Arroz: taking classic Spanish and Moroccan flavors and ingredients, in this case Manchego cheese and harissa, and presenting them in a contemporary, sometimes unexpected way,” Arroz chef Michael Rafidi said. The caption of the third image in this article has been updated.